On May 14, 2013, the Head of the Russian Imperial House, Her Imperial Highness Grand Duchess Maria Vladimirovna, during a trip to Moscow, Omsk and Ekaterinburg, visited MV Lomonosov State University, Moscow’s PI Tchaikovsky State Conservatory and the Museum of the Romanov Chambers in Zaryadiye. In the chambers, which had belonged to her glorious ancestors, Grand Duchess Maria Vladimirovna, escorted by Ms GK Shchutskaya, viewed a new exposition on the 400th anniversary of the triumph over the Time of Troubles, the restoration of the Russian sovereignty and the all-Russian election to the Russian Throne of the House of Romanovs. His Eminence Archbishop Kyrill of San Francisco and Western America of the Russian Orthodox Church Outside of Russia, visiting the territory of the Russian Orthodox Church with the blessing of His Holiness Patriarch Kirill of Moscow and All Russia, was awarded the Order of St Anne, 1st Degree, and his name entered into the Russian Nobility Registry. 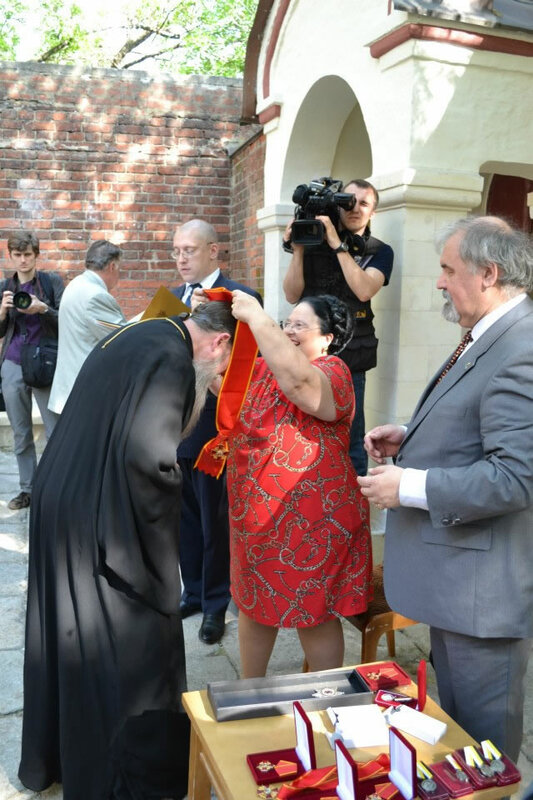 His Eminence was bestowed personally by Her Highness with the Royal Order and gave him awards for His Grace Bishop Theodosius of Seattle (Order of St. Anne, 2nd Degree), members of the Diocesan Administration of the Western American Diocese and other Russian eminent figures of California. Among those receiving orders and medals by the Head of the House of Romanovs were Mr VE Churov, President of the Central Election Committee; Mr AK Levykin, Director of the State Historical Museum; Archimandrite Tikhon, Prior of Nizhny Novgorod Ascension Pechersky Monastery; Ms Shchutskaya, and other eminent cultural and humanitarian figures. A dinner was hosted that evening to which Her Highness invited Archbishop Kyrill and Mr PA Karakozov, his associate. During the dinner, Archbishop Kyrill reported to Grand Duchess Maria Vladimirovna on the state of affairs in his diocese, the celebrations marking the 400th anniversary of the Romanov Dynasty in the Russian diaspora. Her Imperial Highness told His Eminence of the divine services scheduled in the cities of Omsk and Ekaterinburg, and of her anniversary visits to her Homeland and other countries.